Interested in becoming a freelancer? Here are some stats to know. Every year, more and more people are joining the freelance workforce. According to freelancing platform Upwork, there were 55 million freelancers in the U.S. in 2016 -- an increase of 1 million compared to 2015. With freelancers making up 35 percent of the entire U.S. workforce today, there’s a lot to learn about this growing group of independent workers. By surveying more than 6,000 American adults, Upwork partnered with the Freelancers’ Union to release Freelancing in America 2016, a report that reveals surprising trends in the freelance economy. Turns out, young people are the most likely candidates to join the freelance workforce. Compared with every other generation, gen Zers have the proportion of freelancers in the workforce (47 percent). And they’re not choosing this career path by necessity, but instead by choice. Seventy percent of gen Zers are freelancing today by choice, rather than need. However, that extends to other generations too. In 2015, 53 percent of people were freelancing by choice and not necessity, and this number has increased a whopping 10 percent over the year. It’s no surprise that more and more people are becoming freelancers -- in fact, more than three quarters of freelancers today enjoy working independently rather than for a traditional employer. And that might be because 85 percent of freelancers describe themselves as “engaged,” while only 68 percent of non-freelancers say this. So why are so many people becoming freelancers? For freedom and flexibility. The top three reasons people are choosing the freelancing route is to be their own boss, have a flexible work schedule and be able to work wherever they want. Seventy-seven percent of freelancers agree that the career path provides them great work-life balance. Thinking about hopping on the freelance bandwagon? 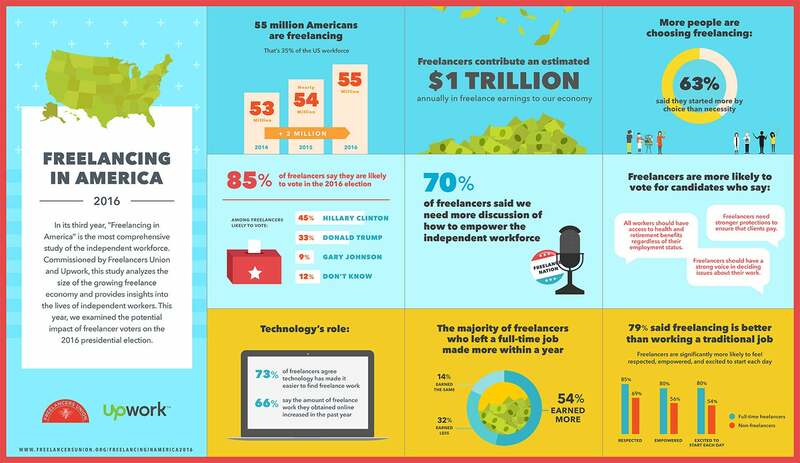 Check out the infographic below to learn more about the freelancing in America.